I thought it would be the perfect salad to say au revoir to summer as it encompasses so many of summer’s delights – peppers, figs, carrots, & arugula. Yet, this salad almost didn’t happen as my Labor Day didn’t get off to a great start. Stress, lack of sleep, & winding down a 3 day juice fast put my head in loopy order, & somehow, during my dog walk I managed to drop my keys (not just house keys, but car key, garage key, mail key, Mom’s key, etc), somewhere in a large over-grown grass field. Three thorough scours with no luck & I was convinced that someone had “found them-kept them.” Not yet ready to claim defeat, but needing a back-up plan to at least get into the house (the Pug was overheating & ready for her breakfast), I called upon a neighbor to borrow a phone to call Mom who had my spares (but lives an hour away). Turns out said neighbor had a ladder tall enough to reach my second story open window. Yes, I risked life & limb, & broke into my own house after losing my keys. Not my finest moment, but I got in safely, the Pug had her breakfast, & I returned to the field once again to (hopefully) find my keys. Let me tell you, that this is not like me. I don’t lose things. I have a photographic memory, so I am the one that quickly finds things, or knows exactly where you may have misplaced your cell phone, wallet, glasses, etc. just by doing a visual memory scan. I’m NEVER the one that loses things…until I did. Luckily, a fourth go around the field ended in me successfully finding my keys…phew. I am a determined little bugger, I get it from my Mother who is ever the sleuth & finder of all things impossibly lost. Oh my, again, I digress, yet it’s somehow related, as I was about to embark on a search for fresh figs – which can be quite like a search for lost keys in an overgrown grass field. A needle in a haystack? 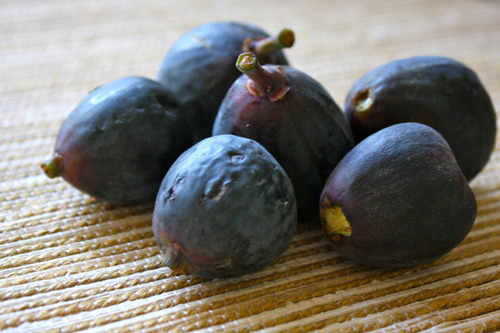 Figs are quite elusive, & anyone who goes on the hunt for fresh figs will agree. There is a small window of opportunity of when one will find them & if so where? In high demand at summer’s end, they are either sold out or the mushy runts of the bunch remain. I’ve typically had success finding figs in late summer at Trader Joe’s, but knowing my luck today I wasn’t holding my breath, & a back-up recipe was already in mind. Ahhh, but there they were – that needle in the haystack. And thus, my salad proceeded as planned. Place the quinoa in a fine-mesh sieve & rinse under cold running water. Bring the vegetable stock to a boil in a medium saucepan over high heat. Add the quinoa & return to a boil. Cover, reduce the heat to low, & cook until the quinoa is tender, 10 to 15 minutes. Scrape the quinoa into a large bowl & set aside to cool. 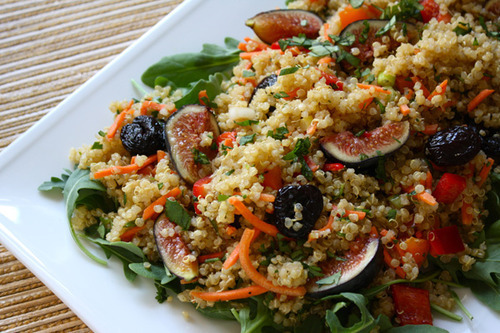 Stir the scallions, figs, carrots, bell peppers, & cilantro into the cooled quinoa. Add the vinegar, olive oil, mustard, salt & pepper to a small glass jar. Shake to combine. Pour the vinaigrette over the salad & stir gently. Top with dried cherries. Serve immediately or refrigerate for up to 3 days. Behold, the salad that nearly wasn’t, but I am so glad came through. 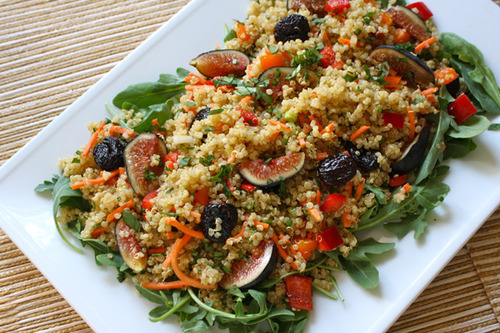 It was full of color & wonderful fresh summery flavors, with lots of protein rich substance from the quinoa. 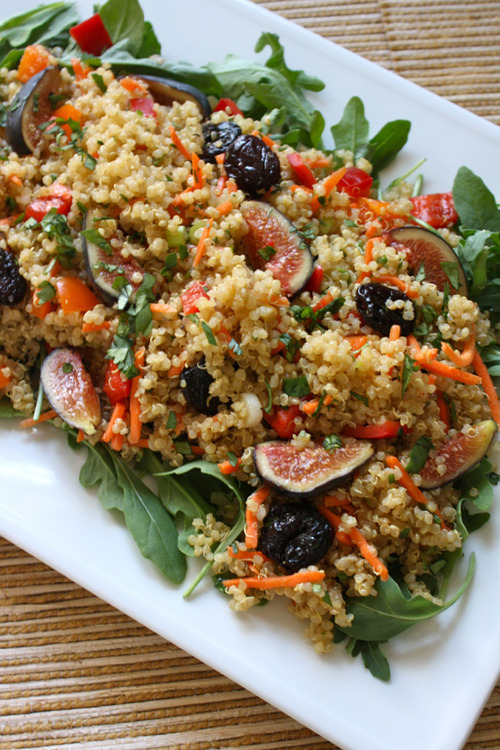 I’ll admit that the addition of figs to this salad was something that perplexed me at first, but as a lover of figs, I gave them a fair chance here & they worked beautifully, adding an earthy sweetness. This is a rare treat that I will surely make next year. Which quintessential summer treats will you miss as fall produce makes its way?